BoltBus has likely steered clear of any fascist associations for the simple fact that they are a bus company—a sector that traditionally has very little in common with far-right politics. 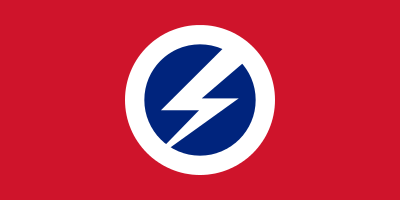 “If this was, say, the logo for the British Columbia Bolt of Truth Party, then I think the danger of making the connection is stronger,” he said. And indeed, the logo does not seem to have hurt BoltBus’ fortunes. Launched just before the 2008 financial crisis, BoltBus has gradually expanded its reach across the U.S. and Canada, and has presided over a decisive turnaround in North American bus ridership. “We felt the lightning bolt as a logo fit the name of the brand,” wrote Gipson. Entirely by accident, it seems, BoltBus has joined a small but growing movement to reclaim other “stolen” symbols of 20th century fascism. This entry was posted in Commerce, Symbolism, Twentieth Century by jgood. Bookmark the permalink.